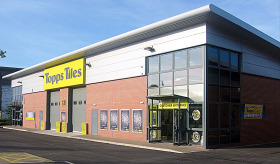 Britain’s largest tile specialist, Topps Tiles, has announced that TV’s property queen Sarah Beeny, is the company’s new brand ambassador. Having hosted a variety of successful TV property shows as well as setting up her own property and investment company, Sarah met the needs to represent the Topps Tile brand. In her role as brand ambassador, Sarah will undertake an extensive portfolio of activity, including writing guest blogs for the Topps Tiles website, featuring in a selection of short videos and speaking at the company’s annual conference. As part of her work with the tile specialist, Sarah will also voice the new Topps Tiles TV advert, which is scheduled to air on major mainstream channels nationally in October and November 2017.